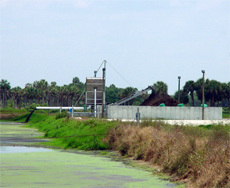 The first application of microbes to a stormwater canal. Biological Treatments continued for several weeks. The microbes ingest carbon, nitrogen, phosphorous at a ratio of 100:10:4. In the presence of calcium carbonate and high pH, an insoluble phosphorous particulate is created by the death of the microbes. This reduces the amount of bioavailable nutrients that are then available for the algae and pathogenic strains of bacteria. EUTRO-CLEAR for Ponds and EUTRO-CLEAR for wastewater are pro-biotic formulas for the bioremediation of ponds, is standardized at a total endospore count of 5 billion CFU /gm, which will multiply in a bucket to 150 billion CFU/gm in 18 hours. Two (2) lbs. of this microbial formulation, hydrated in water, will inoculate a 1 acre pond to many thousand times more than the bacterial biota normally found in a water column (Winogradsky et.) and out compete all the naturally occurring bacteria, including pathogenic gram negatives (E.coli). These select facultative heterotrophic bacteria, augmented into the water column, have specific talents to generate enzymes, lignin, lipid and cellulose degraders which are responsible for the accelerated reduction of TSS (suspended solids) and FOG (fats, oils and grease). The microbes ingest carbon, nitrogen, phosphorous at a ratio of 100:10:4. Ortho-phosphate, a primary nutrient, is reduced by the conversion to ATP within these microbes (Krebbs et.) with alkalinity greater than 1500 mg/l and a pH of greater than 7.2 the deceased microbes will form an insoluable appetitic phosphate. This kind of phosphate will precipitate out of the water column and cease to be bio-available. Oxygen is important only in the higher levels of a natural water column, benthic regions are populated by obligate anaerobes responsible for the digestion of sludge, anaerobic digestion, this the natural way of converting nitrates (a primary nutrient) to nitrous oxide gas, returning nitrogen back to the atmosphere. Oxygen applied to the lower levels of a natural lake or an old established pond are typical erroneous methods employed by engineering firms. D.O. greater than 1.8mg/l will disinfect (kill) obligate anaerobes (beneficial bacteria) and methanogens (swamp gas) will be generated. Augmented facultative heterotrophic bacteria settling into these benthic regions will speed up sludge digestion and reduce odors by using an alternate electron acceptor other than oxygen. Overall, bio-augmentation will reduce nutrient levels, thus reduce the risk of eutrophication and algal blooms. Copyright ©2002-2016 Bioremediate.com LLC. All Rights Reserved.